Is this new Australian film an Aboriginal film? It's a good question. For it's named after the “mixed race outcast” (played by Aaron McGrath from the excellent 'Gods of Wheat Street' and 'The Secret River' on TV) and is directed by Rachel Perkins, whose work has been exclusively in the Indigenous area – 'Radiance', 'Bran Nue Dae' and the 'Redfern Now' drama series. But, from the get-go, when teenage Jasper Jones presents himself at the louvred bedroom window of young Charlie Bucktin, whom he's never met before but has identified as a fellow 'outsider', we unhelpfully see only the dark brown staring eyes of 'The Other'. And it's only towards the end when he attempts to confront the way outsider, Mad Jack Lionel – played, surprisingly sympathetically by Hugo Weaving – that we get any sort of understanding as to why Jasper is on the far edge of life in the WA timber town, Corrigan, in 1969. But is his classic story of Aboriginal disadvantage enough to explain his one-dimensional haunted look? In reality, it's the town itself which is both haunted and the main character in this film – with a rotten corruption the reveals itself in racism, in adultery and in its preparedness to cover up the incestuous perversion of its children. 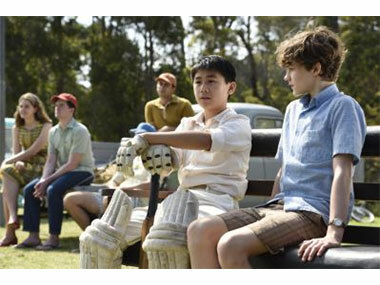 'Jasper Jones' began life as a novel which I haven't read, but which has become a school set text; it's also been a play sufficiently popular to get repeat seasons. But it's hard to understand why on the basis of Perkins's film. For so much is both unreasonable and unexplained. Why does 'Red Dog 2's Levi Miller's wide-eyed, nose-in-his-books Charlie head out into the night with this mixed-race stranger? And why does he accept unquestioningly Jasper's denial of blame for the death of the girl they find hanging from a tree in the middle of this night-time forest? And why doesn't Jasper reveal at this stage that he was in love with this dead girl and might have saved her if he'd arrived earlier with the funds for them to run away together? And why is the dead girl's younger sister – soon to be a love interest for a totally unprepared Charlie – so calm and collected in the face of her sister's death? It really is hard to empathise with these central characters under such circumstances. Oddly, for me, the most empathetic character is Jeffrey, Charlie's Asian mate played by Kevin Long, who works so smilingly and so hard to prove himself a good Aussie in the face of Corrigan's ugly, unprovoked racism towards him and his family. OK – so two local boys have been called up for Vietnam and another has been killed there. Is that enough to infect a whole community (apart from Charlie and his family)? But how important Jeffrey is in defining the sort of courage that I assume novelist Craig Silvey intended to be the heart of his book – that of the totally un-Super Batman in taking on the forces of evil, rather than that of an invincible Superman for whom Kryptonite had to be invented to create a chink in his armour – about which the boys debate thoughtfully. Which brings me to the most interesting dynamic – which is Charlie's family. The bookish boy has a bookish, teacher father – played ever so gently by Dan Wyllie, secretly writing a novel. But, in Toni Collette's over-the-top mother, we have a character who's already halfway out of town in her frustrations at its limitations. This drives her to take it out on Charlie and his father even as she expresses her love for them both. An interesting bundle of contradictions. But at least explicable. Poor Levi Miller has his innocent face down to perfection; but is never given the lines to answer the questions that mum, girlfriend (played by a worldly Angourie Rice) and the police pepper him, leaving us up in the air as to whether he's blindly following some literary adventure story, or genuinely being Batman-courageous. Even as Corrigan and the film seem to lose track of the missing, presumed dead/maybe runaway girl, mention must be made of the brief, agonisingly unlovely performance by Susan Prior as the girl's mother, wife of the Shire President. She is Corrigan personified.